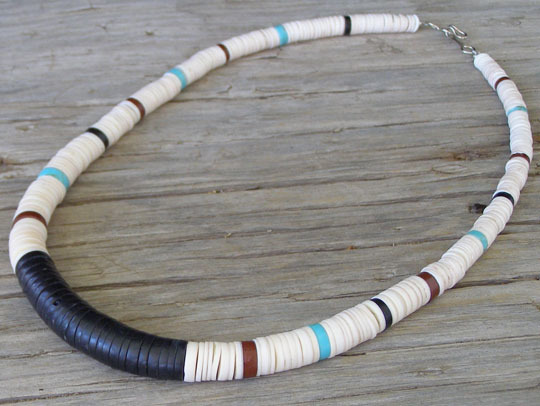 This is a short to medium-length choker made from hand-turned disk beads and strung in classic Santo Domingo Pueblo color combinations. Using a combination of shell and stone beads, these necklaces mostly rely on the rich reddish-brown of pipestone mixed with Kingman turquoise, snow white clam shell, creamy melon shell and jet strung in banded patterns of color. Many Santo Domingo artists make these necklaces and each artist employs distinct and unique patterns in stringing color combinations from the same basic raw materials. This necklace is strung on Beadalon stringing wire for maximum durability. Beadalon is a nylon-sleeved braided steel wire. The smooth coating of nylon allows the beads to slide freely on the string and makes for a nice "hang." At the same time, the polyurethane coating prevents the wire from wearing and chipping the beads and prevents the beads from wearing out the string.